"Ummm, who would wear that ruffle monstrosity." My mom convinced me to at least try it on, and much to my surprise it looked bangin'. Another point for you mom! So now I'm the one who would wear that ruffle monstrosity. "Bri, you look hot. But you know that we are going to see a dollar movie...in Provo." In the end, the dollar movie was a bust so we meandered Barnes & Noble and Best Buy, then went home to make dinner together and cuddle and watch a movie. And during this photo shoot, these dumb shoes broke. As soon as I'm makin' boo-koo bucks, I'm investing in some nice-ace shoes. Steve Madden, Zara, ShoeMint, etc etc. "I'm gonna buy this really cute cheap pair of shoes and they will last me forever!" Anyone read that "Fast Food Fashion" book yet? Cause I think that's the jist of the book. Now I'm off to convince my body to get up and work out. Or at least just to put on the work-out gear. everything about this outfit is HOT! The shirt, the heels, the haiiiiir is perfect! Love it ! best buy and barnes and noble is one of my husband and i's favorite dates! we are twins. and you look foxy! I love the ruffles! So cute. I had the same problem with the gym today, I got there and was like blahhhh why do I do this. Then after I was like oh yeah.... if only I could have that oh yeah moment first. That top is super cute on you! Most of my wedge are Steve Madden and I love them. But I get most of them at a discounted price at Nordstrom Rack, Marshall's, Ross, DSW...I don't think I've ever bought a full priced pair of Steve Madden's because they can get pricey! 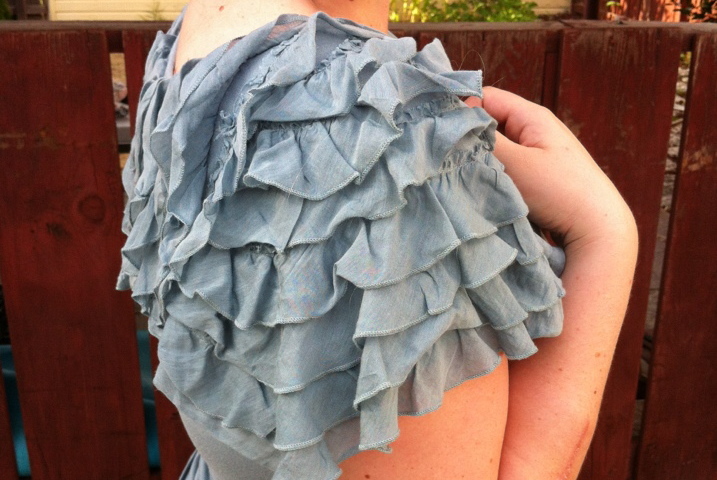 I love the ruffle details in your top - so gorgeous! do you have some questions? Designed by Breezy Days. Theme images by Jason Morrow. Powered by Blogger.